Phobias - body, causes, What Are Phobias?, What Causes Phobias? Phobias (FO-bee-az) are unrealistic, long-lasting intense fears of certain objects or situations. These fears can be so strong that people go to great lengths to avoid the object of their dread. Sigmund Freud (1856-1939), one of the greatest psychological thinkers in history, was a psychiatrist and the founder of psychoanalysis (SY-koa-NAL-i-sis), a treatment method that focuses on deeply hidden fears and internal conflicts. One of Freud's most famous cases involved Little Hans, a 5-year-old boy who had a great fear of white horses with black mouths. After learning more about Hans and his family, Freud concluded that the horse actually stood for, or represented, the boy's father, a white man with a black mustache. Freud believed the boy was secretly resentful of his father but was too afraid to show his feelings. Instead, he "displaced" these feelings and developed an unreasonable fear of being bitten by a white horse. Freud theorized that phobias were actually displaced fears or conflicts. Modern researchers believe that the tendency for phobias may run in families and that many phobias are learned. People have long been fascinated by phobias, unreasonable, long-lasting fears of particular objects or situations. These fears can be so serious that people will severely limit their lives to avoid the object of their dread. Phobias can affect people of both sexes and all ages, although they are a little more common in women than men. About 8 percent of adults in the United States experience this problem, and many report that their phobias started in childhood. There are three main types of phobias: specific phobias, social phobia (also called social anxiety (ang-ZY-et-tee) disorder), and agoraphobia (a-gore-ra-FO-bee-a), which can be described as a "fear of fear." Acrophobia (AK-ro-fo-bee-a): an abnormal fear of heights. The word comes from the Greek "akron," meaning "height." Ailurophobia (ay-LOOR-o-fo-bee-a): an abnormal fear of cats. The word comes from the Greek "ailouros," meaning "cat." Algophobia (AL-go-fo-bee-a): an abnormal fear of pain. The word comes from the Greek "algos," meaning "pain." Autophobia (AW-to-fo-bee-a): an abnormal fear of being alone. The word comes from the Greek "autos," meaning "self." Cynophobia (SY-no-fo-bee-a): an abnormal fear of dogs. The word comes from the Greek "kyon," meaning "dog." Erythrophobia (e-RITH-ro-fo-bee-a): an abnormal fear of the color red or of blushing. The word comes from the Greek "erythros," meaning "red." Gynephobia (GUY-neh-fo-bee-a): an abnormal fear of women. The word comes from the Greek "gyne," meaning "woman." Hemophobia (HE-mo-fo-bee-a): an abnormal fear of blood. The word comes from the Greek "haima," meaning "blood." Mysophobia (Ml-so-fo-bee-a): an abnormal fear of dirt and germs. The word comes from the Greek "mysos," meaning "uncleanness." Nosophobia (NOS-o-fo-bee-a): an abnormal fear of sickness. The word comes from the Greek "nosos," meaning "disease." Pedophobia (PE-do-fo-bee-a): an abnormal fear of children. The word comes from the Greek "pais," meaning "child." Xenophobia (ZEN-o-fo-bee-a): an abnormal fear of strangers. The word comes from the Greek "xenos," meaning "foreign." People with specific phobias have a deep, unreasonable fear of specific objects or situations. Some common phobias include closed spaces, dogs, heights, escalators, tunnels, water, flying, and blood. The fear is not only extreme but also irrational. For example, a woman who is phobic about walking over a bridge may feel extreme panic in that situation, even though it poses no actual danger. Teenagers and adults with phobias realize that their extreme fears do not make sense, yet they are unable to control how they feel. Children with phobias usually don't realize that their fear is unfounded, and may believe, for example, that thunder is actually dangerous. No matter what someone's age, facing, or even thinking about facing, the feared object or situation brings on severe anxiety, an unpleasant feeling of fear or nervousness. To fend off anxiety, people often avoid what they fear. If the object or situation is a common one, this can limit their activities. To make matters worse, the more people avoid what they fear, the greater the anxiety becomes the next time they are faced with it. 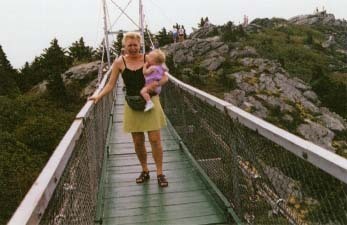 A woman walking over a bridge is seized by intense fear. People with social phobia (also called social anxiety disorder) have an extreme fear of being judged harshly, being embarrassed, or being criticized by others, which leads them to avoid social situations. Social phobia is much more than normal shyness. For example, people with social phobia may be afraid to eat in a restaurant, go to a party, answer a question in class, or give a speech. Some people have a broad form of the disorder, in which they fear and avoid almost any interaction with other people. This makes it hard for them to go to school or work or to have any friends at all! People with agoraphobia are terrified of having a panic attack in a public situation from which it would be hard to escape. For example, they may be frightened of busy streets or crowded stores. If left untreated, the anxiety can become so severe that people refuse to leave their homes. If they do go out, they may be willing to do so only with a family member or friend, and they may still feel great distress. Freud thought that phobias were caused by deeply hidden conflicts in the mind. One of his chief critics was John B. Watson (1878-1958), a psychologist and the founder of behaviorism, a school of psychology that focuses on how behaviors are learned and influenced by the environment. Watson answered Freud's case of Little Hans with his own case of Little Albert, an 11-month-old baby. Watson wanted to prove that the fear of a particular object could be learned, so he showed the baby a white rat at the same time that he made a loud bang on a metal pipe. Before this, the baby had not been afraid of the white rat and had reached for it playfully when it was presented without the noise. Albert had, however, shown a fear response to the loud noise, as most children his age will do. After seeing the rat and hearing the loud sound together several times, though, Little Albert learned to fear the rat, even without the noise. This is an example of classical conditioning, in which people learn to associate a certain response (fear) with a previously unrelated situation or object (the rat). Given enough pairings of a fear response with a neutral, ordinary object, the object can become feared. * genes are chemicals in the cells of the human body that help determine a person's characteristics, such as hair or eye color. They are inherited from a person's parents. * amygdala (a-MIG-da-la) is a small almond-shaped structure in the brain that plays a part in processing emotions. Much research has focused on finding biological causes of phobias. A tendency to have phobias seems to run in families, as does the tendency to have anxiety in other forms. Studies have shown that genes * may play a role in some cases. In other cases, anxious family members may unknowingly "teach" others to be fearful or avoidant. Other studies have looked at the part played by the body's fear response, which is rooted in a part of the brain called the amygdala * . When faced with real or imagined danger, the body sends signals to the amygdala, a part of the brain that connects memory with emotion. The amygdala "remembers" the fear associated with this situation or object and sets in motion the "fight or flight" reaction, physical changes that ready the body to react to a threat. The heart starts to pound and send more blood to the muscles for quick action, while stress hormones * and blood sugar flood the bloodstream to provide extra energy. In people with phobias, a scary experience, even one involving a harmless situation, can create a deeply etched memory of fear. With the help of the amygdala, this memory can trigger an automatic fear response when similar situations come up again, even if the fear is unwarranted. Others: for example, loud noises, choking, or getting a particular illness. Phobias can start at any age. While it is normal for children to have several fears, occasionally childhood fears become so intense they are considered phobias. Some specific phobias that are common in early childhood (the dark, ghosts) disappear with time. Specific phobias that affect teens and young adults tend to be longer lasting. Only about one in five adult phobias goes away without treatment. * hormones are chemicals produced by different glands in the body. A hormone is like the body's ambassador: it is created in one place and sent through the body to have effects in different places. If the phobic object or situation is easy to avoid, people with phobias may not feel the need to seek treatment. When phobias interfere with people's lives, however, treatment can become necessary and often is very helpful. The usual treatment for specific phobias is exposure therapy, in which people are gradually introduced to what frightens them until the fear begins to fade. At least three-fourths of people with phobias improve with exposure therapy. Some may be reluctant to try this at first, since it involves facing fear rather than avoiding it. Relaxation and breathing exercises also can help reduce anxiety, making it easier for people to participate in exposure therapy and face the object or situation they fear. In addition, medications to relieve anxiety sometimes may be prescribed. The psychologist John B. Watson (1878-1958) is considered to be the father of behaviorism. He believed that human behavior depends not on the mind or feelings, but instead on our environment and experiences and how we learn to react to them. Anxiety Disorders Association of America, 11900 Parklawn Drive, Suite 100, Rockville, MD 20852. This group is for people with an interest in phobias and other anxiety disorders. Anxiety Disorders Education Program, National Institute of Mental Health, 6001 Executive Boulevard, Room 8184, MSC 9663, Bethesda, MD 20892-9663. This government program provides a wide range of information about phobias and other anxiety disorders. www.healthfinder.gov , a resource affiliated with the U.S. Department of Health and Human Services, has an article printed in full called "Fighting Phobias, The Things that go Bump in the Mind" by Lynne L. Hall. i have emetophobia and i would like to learn more about them and why panic attacks occour.